I am terrible at drinking enough water. I mean terrible. It’s a bit horrifying really. Although I often get liquids through the food I eat, there have been evenings where I realize that I never drank a glass of water that day. Not one! I think back on my health issues – chronic fatigue, muscle cramps, headaches, digestive issues, chronic inflammation, joint pain – and wonder how much of that is due to the fact that I am chronically dehydrated. Water makes up at least two-thirds of the human body. It plays a large part in normal bodily functions, such as lubricating your joints, keeping your brain and eyes hydrated, flushing toxins from your cells, and facilitating proper digestion. Chronic dehydration can lead to diseases like high blood pressure and high blood sugar so it’s super important to get enough water. I’ve tried for years to drink more water. The habit never sticks for more than a few days. Honestly, I love water once I actually pour some down my throat. However, my brain never thinks “water” when I’m thirsty and I get so caught up in daily life that I forget to drink anything at all. I need to get healthy though an I know that starting with water – proper hydration – is important. I’ve proven again and again to myself that I just can’t make it happen on my own. I need help. So, in an attempt to motivate and remind myself, I bought a “hydration” bottle. Well, I actually tried two of the leading bottles out there to see what I thought. These “smart” water bottles remind me to drink water and track my water consumption so I can know how much I’m getting. I did a lot of research into what’w available out there as far as water bottles that track your intake. The two that I liked the best were HidrateSpark and MyHydrate. * MyHydrate says that they will only accept a return on unused bottles still in the package. That’s kind of dumb to me because you can’t even try it to see if you like it then. The return policy on the HidrateSpark bottle is a SATISFACTION guarantee so you can return it if you try it and don’t like it. OMG the HydrateSpark smart water bottle is pretty. It makes me feel healthier just looking at it. 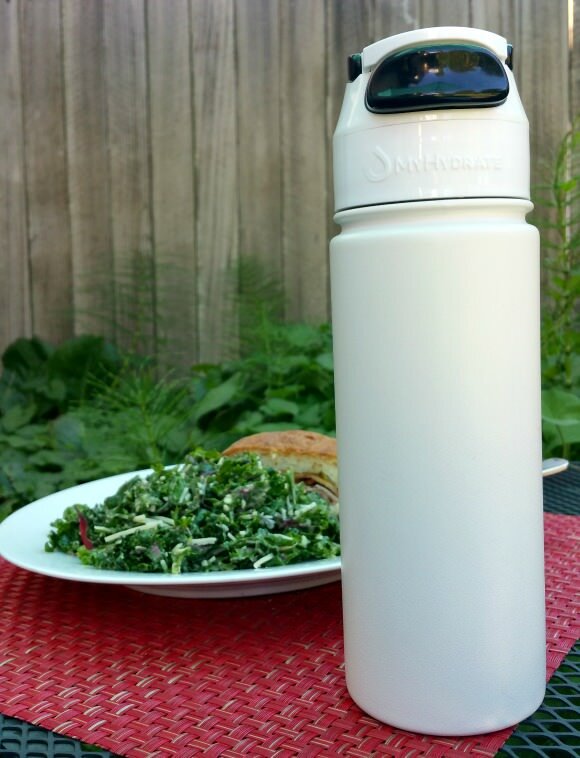 The production of this bottle originated on Kickstarter in June 2015. They raised 17 times their original goal of $35,000 (which they met within the first 20 hours) and raised $627,644 from 8,015 backers. I was one of them. The bottle contains a sensor stick that can “feel” or “see” how much water is in the bottle when it’s set on a flat surface. I don’t know the specifics but the bottle somehow combines the current level of the water with the volume of the bottle for their calculation. As you drink and then set the bottle back down on a level surface, it adds the amount of water now “missing” to the total you’re drank for the day. I received my bottle in May of this year so I’ve had it for a couple of months. It was their first like production of the bottle (that went out to the public – they did a lot of testing before) and, I’ll be honest, there were problems. I won’t go into them but the bottom line is that they sent me a replacement bottle that worked much better. I really want to love it but, although it was way better, the replacement bottle still didn’t work quite right. However, the HidrateSpark 2.0 bottles, with even faster syncing and brighter glow, are coming in December. I can’t wait to try one. Inaccuracies occur when refilling the bottle – the water consumption always jumped up, sometimes by a few ounces and sometimes by up to 12 oz. I purchased the MyHydrate smart water bottle a few months ago. When I did, they had a couple of versions available on the website. I purchased the insulated stainless steel version. Apparently that was a limited edition and is no longer available. The only one available for purchase on their website now is a transparent white Tritan plastic bottle. It’s too bad because the insulated bottle helped keep my water cool. 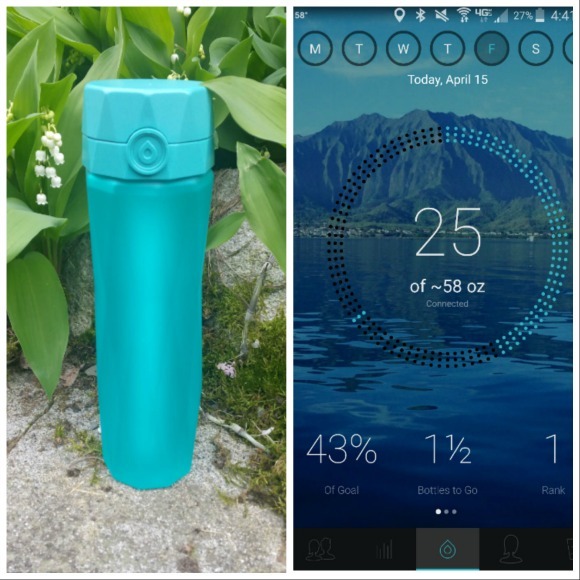 This bottle uses simple technology to track your water intake. There are LED lights on the cal and illuminates every 8 oz. that you drink. However, I have no idea what it thinks my goal for the day is so I’m not sure if I’ve ever reached it. I do know that I’ve never drank enough water to make all of the lights on top glow. UPDATE: Each light represents 8 oz. The bottle has 8 lights so that means the goal for the day, no matter your age or weight, is 64 oz. A simple calculation is used to gauge how much water you are drinking. It estimates the water you’re drinking by combining the time the “open” button is depressed, the length of time the bottle is tipped on it’s side (it uses a pedometer-type piece to to know when that is), and the flow rate (the amount of water that can come out of the valve every second when tipped). You control when the consumption resets and it’s quick and easy to do. The reminder beep is loud enough to be heard in another room or if it’s inside of your gym bag. The audible beep can be annoying or disruptive in public, especially if you were at a meeting [drink enough water though and it won’t ever go off right? :)] UPDATE: The new version of the bottle has a quiet mode. The LEDs still flash to quietly remind you when it’s time to drink. You have to remember to manually reset your water consumption tally every 24 hours. UPDATE: The new version of the bottle will reset every 24-hours on it’s own. You can choose the time of day you want it to reset (say, 5 am every day) by pressing the reset button once at your desired time. Am I drinking more water? Yes. Even though the HidrateSpark bottle is a bit inaccurate, and doesn’t always connect, the graph does always trend upwards. I at least know the goal I am shooting for and can adjust “upwards” of the goal number by drinking an extra glass of water if needed. Also, I like being able to add like “extra” water manually. I say get this if you want a pretty bottle, are a digital person, and like to treat drinking water like a game. The HidrateSpark bottle is $54.95 and holds 24 oz. The bad news is that, at the time of this writing, the Version 1.0 bottle is sold out. You can pre-order the HidrateSpark Version 2.0 but it’s not estimated to ship out until December. 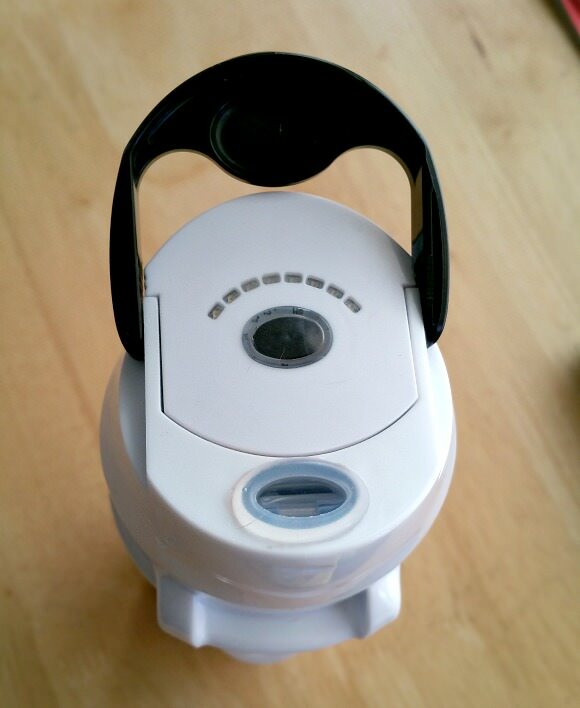 The MyHydrate bottle is like that helpful friend or your Mom – yells at you from the other room to “drink more water”. It may not be clear how much water I’m aiming for but it’s certainly clear on WHEN I need to drink. Get this if you want clear alerts of when you should drink, low-tech, and reliable consistency. The MyHydrate bottle is $39.99 with free shipping and holds 22 oz. (UPDATE: The updated version of the bottle holds 26 oz.) This bottle is available now so, if you can’t wait until December, it’s your only option between the two right now. It’s really cool that there are bottles out there to tell you how much you’ve drank. I have the same problem with getting enough water, so thanks for the post! Jessica, when I first came to this site I thought maybe it was an ad for one of the bottles, but thankfully your article was unbiased, full of information and really helped me to make a choice! I wish there were more honest people like you on the internet! Thanks so much. Thanks Stacy. Because this blog is part of the way I make an income, I do often accept goods or services for my product features/reviews. I have a lot of product review experience in my past so I work hard to be unbiased in all of my reviews – pointing out both pros and cons and what we loved alongside what we didn’t – no matter what. It just happens that I did purchase these bottles myself. I’m glad you found my review helpful. I am getting ready to add an update or, rather, more of a clarification. Since this review people have pressed me to pick my favorite. Honestly, I still can’t. The MyHydrate bottle is definitely more reliable with reminders but I am personally more motivated to drink by the constant tally on the HidrateSpark app (even if, yes, it doesn’t work perfectly). Far too much technology. Fill a container with water and drink it. Goal accomplished. We’re actually on the list to get a HidrateSpark in December. Interested to see how well we like it. I’ve gotten a lot better at drinking water recently (being pregnant kinda forces you to), but I’ll be interested to see how much I’m actually getting with the bottle…and hopefully keep it up once baby gets here! Awesome. I would love to hear what you think if it. I will be getting the new version in December too so I’m excited. Hopefully the connectivity issue is solved (sounds like it will be but that is theory, not practice). So between the two bottles which do you prefer? I just ordered the myhydrate bottle but not sure if I want to keep it. I honestly don’t have a favorite. I would have said so 🙂 I laid out what I think the pluses and minuses are for each to help people make their own decision between them. I’ll keep and use both. Imagine that! This is actually the first time I’ve heard that a technology like this existed let alone knowing these water bottles are already being sold in the market! I’m definitely getting my wife and I one each! Thanks for the info. I wanted to get the my hydrate bottle, but wasn’t finding any reviews other than on their site. Your review was great help. This might be posted somewhere in the comment, but I didn’t see it, so forgive me if I’m repeating something that’s been said. I’ve had my Myhydrate bottle for a few weeks now and I’m definitely drinking more water. I was like you at the beginning of your post. Your goal is to light up all the lights, approximately 64 oz, and when you do, you get a cute little jingle and the lights flash! Lol! I’ve only done it twice, but I’ve gotten close, often. So impressed I bought one as a gift for my sister, who’s just as bad as I am about water. I just got the myhydrate bottle yesterday. If you fill up the bottle 3 time’s, you’ll hit the “goal”. I have always had a water bottle full and ready to drink. I do great in the morning, but stop thinking about it in the afternoon and don’t drink enough for the whole day. I love the little lights to remind me I haven’t had enough yet. So far I’m loving it! I’ve never managed to drink enough but good to know that 3 bottles may be all I need to hit my goal. Purchased myhydrate and have had nothing but problems. The thing just beeps for no reason and I can’t reset the counter. It shows I drank a full day when I never even had one sip. Way over priced and not worth the money. Tried returning it and the company wouldn’t stand behind their product. Do not buy from them. I now have a way over priced bottle that matches a free one I received. I think they just throw a lid on a free bottle. That’s too bad that it’s not working out for you. Perhaps you got a defective one. Mine “beeps for no reason” in the cupboard. I guess I figured when I got it that I could turn that on and off but apparently once the bottle is activated, it constantly beeps when you “aren’t drinking enough water”… including when you’re not actually using it. I can, however, reset the light meter to zero on mine but, yes, the bottle would be worthless if I couldn’t. I also had a negative experience with MyHydrate and would not recommend purchasing it. After a few uses I ended up just sticking a straw through the suction hole at the top because it took so much effort to drink out of the lid so the mechanical technology could register how much you were drinking. I didn’t use it very often because it was kind of a hassle, but I probably used it a half dozen times because it was a good size to fit in my purse. Then one day I was hand washing and the button popped out and the spring fell inside the lid, so it was no longer functional. I contacted customer support to see if they had a warranty on their product and they said that min was out of warranty (it was about 4 months old), so it would cost another $15 for a replacement lid. I didn’t opt to buy one, since I wasn’t too fond of it any way. The meter does continue to beep… I can’t figure out how to turn it off either…. I also find it very interesting that no one on the MyHydrate site is there any place to leave a review. Thank you so much for posting this unbiased assessment and a place for us to leave comments. I’ve had my MyHydrate bottle for a couple of weeks. I love it and find it very helpful in getting me to drink the amount a water I need every day. In reading these reviews I found a number of misinformed statements that I would like to clear up. 1. The bottle holds 26oz. 2, The bottle resets it’s self every 24 hours. You do not need to reset manually. It restarts at the same time you originally started it. You can manually reset that start time if you wish to change it. 3. It has a set goal for you to try to attain. 8 8oz glasses, which is what health officials recommend for good healthy hydration your body needs each day. I have managed to light up all the lights each day. It plays you a little tune when you do that. Then you can keep drinking knowing you have reached your goal and more. I would, and have, recommended it to friends. Hi Kathy. The bottle I am reviewing here is their very first model. They have not provided me a current bottle to review. I suspect you have one of the newer versions. The bottle is totally different and likely holds more liquid than mine does. It’s nice to hear that they fixed the reset issue so it does it on it’s own. Glad to hear you like it. 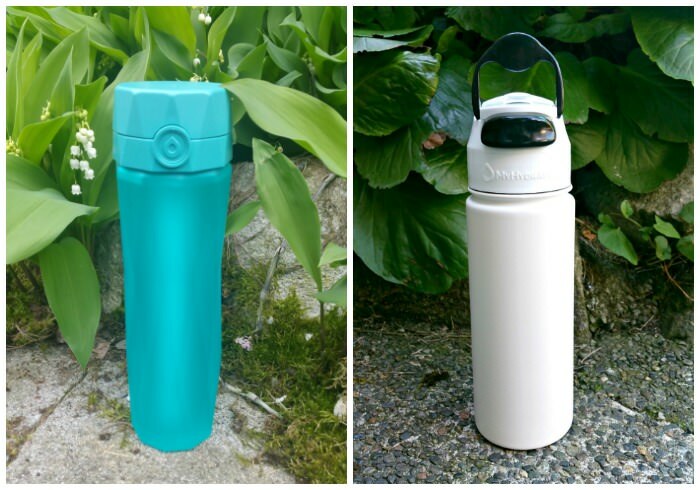 When I was contemplating getting a hydration bottle as a present for my wife, I stumbled on this review. 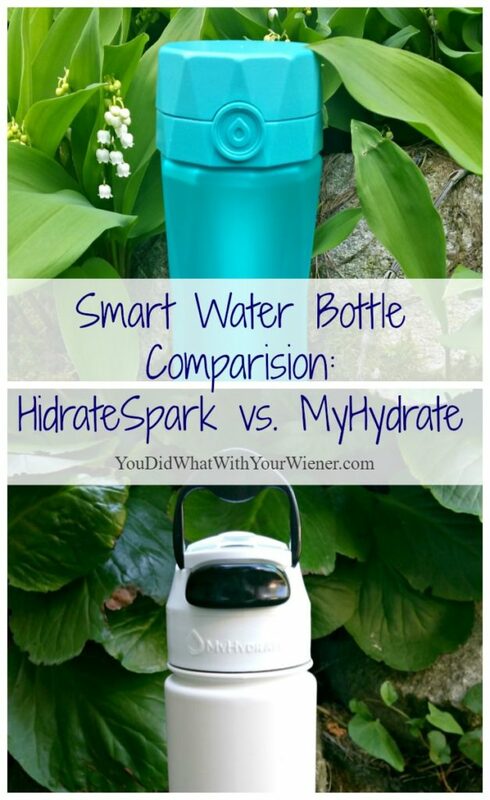 Based on your review (and a few others out there), I purchased a Hidrate Spark 2.0 bottle in February of 2017. It took about 8 weeks to get the bottle but my wife was very happy with the initial product, so happy, in fact, that she talked me into ordering one for myself. I am a busy physician and so your statement about not adequately hydrating during the day resonated with me. Indeed, I found myself drinking considerably more water (and visiting the bathroom more frequently) during the day and had several coworkers and patients comment on the bottle, which I enthusiastically endorsed. Alas, the honeymoon soon ended. I ordered my bottle in mid April and received it in the middle of June. All was well until July 22nd. On that day the Hidrate bottle went from a smart hydration device that tracks your water intake to, well, a pricey “dumb” water bottle. After a couple of days and doing my own troubleshooting, replacing the battery, etc…I contacted customer service. The service experience was a little disjointed, almost as though the replies were coming from the opposite side of the globe, but the ultimate problem seemed to be a failure of the sensor stick. I was advised that I would receive a new sensor stick in a prioritized fashion. Since that time, I have had several requests for an update on the sensor stick and/or a refund receive polite yet vacuous responses and it is clear that they have zero interest in standing behind their product or giving me a refund. I have zero ax to grind with the company…it is clear, however, that reviews like yours fail to tell the whole story. I would caution your readers to do their due diligence. Hi John. I’m sorry that happened to you. I can only speak to my experience and that has not been mine. So it’s not that I “failed” to tell the whole story, it was just not a part of my story. As with any opinion piece, it is by nature a “one sided” view. I’m glad you shared your experience here so that another perspective and experience was brought to light. Dehydrated and Stressed! MyHydrate failure. This bottle is very expensive for what it doesn’t do and customer service is non-existent. Other reviewers had a similar experience. I can’t believe I fell for this. I only saved the bottle to use as a teacher for an object lesson on how to complicate something as natural as drinking water. My biggest complaint is trying to get water out of it. It was a struggle to get anything. Out of frustration, I gave it to my son who has many types of water bottles. After a week he gave it back and said he could drink more out of his child’s sippy cup and could not turn off the beep which woke him up during the night. It started beeping before I ever used it. It arrived, beeping. Wonder what the post office thought? I do like the pretty turquoise bag it comes with. SAVE your money and put a timer on your phone or Fitbit as a reminder to drink water. I’m sorry you had such a bad experience. I haven’t tried to contact customer service so I can’t speak to that. I did have a strange experience with one of the owners or employees after I wrote this though. I hoped it was just a fluke. However, I did not experience the same difficulty drinking out of the bottle. Sure, it’s didn’t pour water out as fast as a wide-mouthed jug but, given the size of the opening and the need to meter the water, I didn’t expected it to. IF you need a bottle that will instantly dump a lot of water in your mouth then, yes, I can see how this is something you would be unhappy with. The battery on MyHydrate bottle died Mid-October after having it for about 5 months. There were no instructions on how to change the battery, just what size battery to use, so I removed the screws & replaced the battery. Now the only thing that happens is when I put the reset button all 8 lights come on, then turn off. I have tried calling, but the call doesn’t go through, not even a phone company message. I tried emailing customer service, as well as using FB messenger: no answer. I have no idea what has happened to them: if any one knows please let me know!! You’re right, all I see on their website about the battery is that “it’s easy to replace”. It sounds like that is what’s supposed to happen when you push the reset button – all lights come on and then go off. But if it’s then not lighting up to track your water consumption, that is very frustrating. I’m sorry you can’t get a hold of customer service. I’m not affiliated with them in any way. I just wrote about these bottles because I thought others might be interested. I did hear from someone there a few months ago that had found my comparison. Quite frankly, it wasn’t the best exchange. I hope someone gets back to you soon. As of 3/2/18, MyHydrate is sold out of ALL options (inluding family pack) on their website. HidrateSpark is available on Amazon with free shipping but not prime. I was going to use MyHydrate as it seemed better for me, but it’s not even on Amazon now so…who knows I guess. Interesting to know about MyHydrate. It’s not unusual for small, nea companies like that to go out of business. I’ll be interested to see if they just happen to be in a supply lul or that is what is happening to them. On a related note, I did purchase the new version of the HidrateSpark and it works way better than th first version. I’m very happy with it. If you order it on Amazon, make sure it’s the 2.0 version.